What exactly are regions in Scotch and why is it worth paying attention to where the whisky comes from? 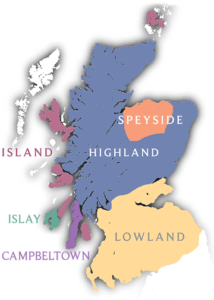 Scotch was traditionally divided up into four geographic regions: Highlands, Lowlands, Campbeltowns, and Islay. The Highlands are northern, the Lowlands southern, Campbeltown is a single town given it’s own region because of it’s high concentration of distilleries (30 at it’s high point, but now there are only three in operation), and Islay is the largest island of all the islands around Scotland. The two other regions discussed within Scotch are Speyside and Islands. Speyside, located in the highlands, is now officially recognized as it’s own region because it has nearly half of all the distilleries in Scotland. The Islands aren’t an official region on their own accord and are part of the Highlands. However, because they have such a flavor both distinct from what’s normally associated with the Highlands and similar to Islay, many people treat them as their own region.